Some of the best shade grown, high altitude coffee beans in the world are grown in Costa Rica. Family farms and artisan processing cooperatives are thriving with the growing popularity of fair trade and craft practices that produce the highest quality natural coffee. Because the crop is so intertwined with Costa Rica’s development, coffee tours are also an excellent introduction to local history. Coffee tours are popular in the Central Valley near San José (Britt and Doka plantations) as well as near Monteverde (Don Juan Coffee). 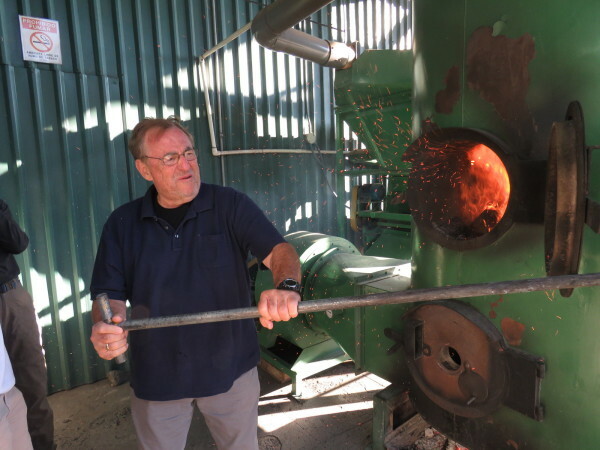 They include a visit to the farm to see the trees in the fields, an explanation and demonstration of the processing, drying and roasting followed of course by a tasting. Small museums of antique equipment and historical presentations round out a fun and educational visit. All the tours have shops where you can purchase the products. 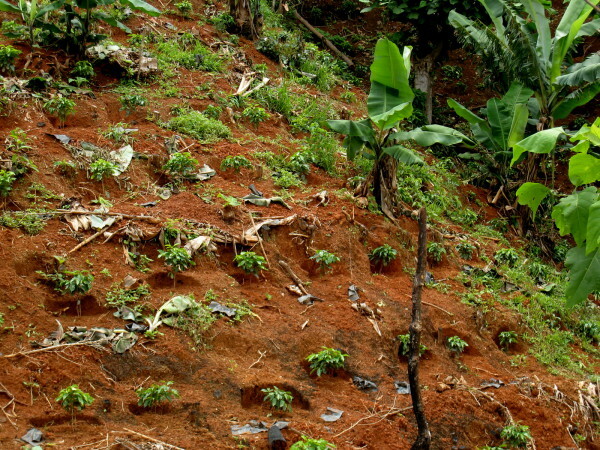 Coffee trees start out in nurseries and are transplanted to the terraces and hillsides when they are about a year old and less than a foot high. They’ll grow for another two to three years before they start producing cherries. Trees? – although the term bush is more commonly used and the plants look like low shrubs, coffee actually grows on trees native to Ethiopia. The producers know that if the trees are pruned regularly to keep them short it increases production. A friend of ours who owns a coffee farm has one tree they’ve left to grow wild and at about 10 years old it’s almost 20 feet tall. Pruning to bush height also makes the coffee much easier to hand pick. Trying to set ladders on the steep mountain hillsides would be dangerous and difficult and no one has invented a machine capable of removing the cherries without damaging the nascent buds for the next season’s crop. Quality coffee is all still picked by hand. Cherries and fruit? – although the term coffee bean is universal and perfectly describes the appearance of what goes in the grinder it’s actually the seed of a fruit that’s referred to as a “coffee cherry.” It’s obvious why they’re called that when walking through neat rows of what look like banzai cherry trees laden with perfect little red fruits ready to pick. 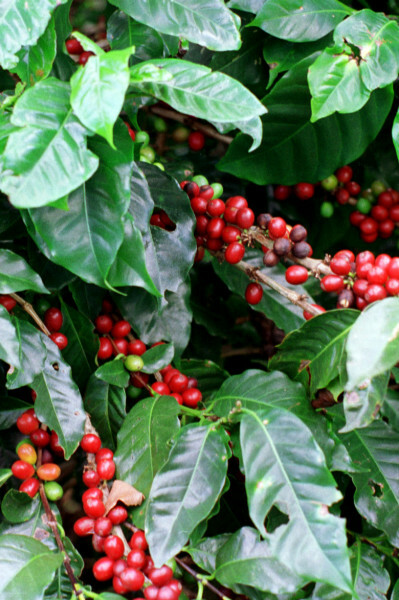 Harvest season runs from October or November through January with the coffee ripening later at higher elevations. Pickers move through the plots several times picking the red and leaving the green to ripen for the next pass a few days later. 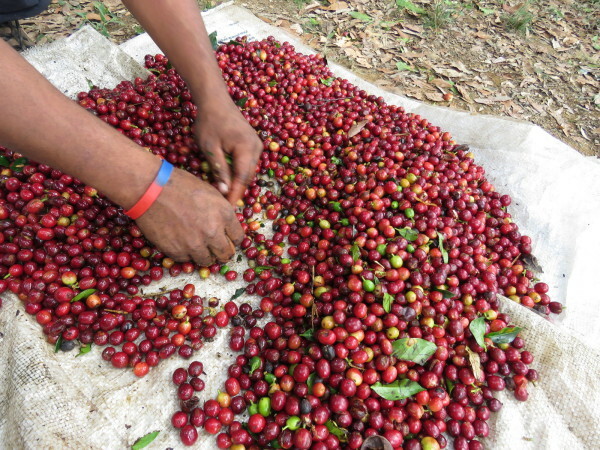 The final quality of the coffee is determined in part by the absence of green cherries. During the measuring process a sample is pulled from each batch, sorted and hand counted to determine the percentage of each color. We’ve been told that one of the reasons Costa Rica has their seasons inverted was so that the long “summer” school vacations could coincide with the three month picking season. Some kids still help their parents in the fields while on vacation but it’s a job that is more typically done by migrant workers from Panama or Nicaragua. 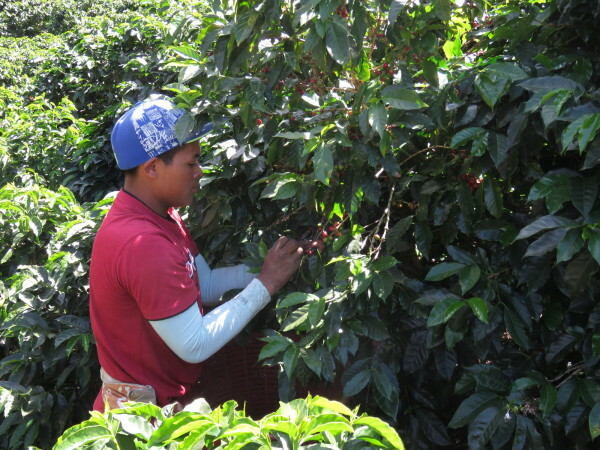 Although harvest season is the most active time the farms are still worth touring after the coffee is picked. The plants start flowering even before the previous seasons crop is completely ripe so from about December through April the distinct aroma reminiscent of olives is in the air and the plants are beautiful contrasts of deep green leaves and stalks of tiny white flowers. Processing continues for several weeks after the picking season. After picking the coffee is sorted and quality checked for the first time by hand. The pickers must remove any green or damaged beans to ensure that their baskets meet the required quality standards. When we first visited the Rodriguez’s farm near Heredia in 1993 the going rate was ¢125 per basket ($1 at the time). When we visited Jim’s farm, Río Jorco Tarrazu Estate at the beginning of 2015 we found out the going rate was up to ¢550 per basket. Unfortunately for the pickers by 2015 ¢550 was still worth about a dollar and that dollar only buys about half as much due to inflation. A really fast picker might be able to collect 10 baskets in a day. Processing takes up to several weeks and can be observed any time from December through late March or April. Tractors haul the cherries to a hopper that mixes them with water to wash them and pump them through rollers that squeeze the peels off revealing the beans. After the peels are removed they are composted to produce fertilizer and the beans are scrubbed to remove the mucilaginous inner coating. 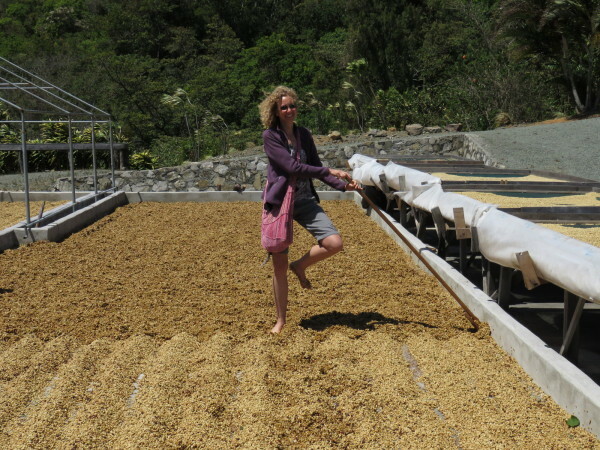 The beans are spread in the sun to dry and must be turned several times during drying to prevent mold. After the sun drying the moisture content is fine tuned with a short tumble in a mechanical dryer that is fired by the parchment skin from the previous batch and the wood from pruning the bushes the previous season. The parchment skin is tumbled off the green beans (and added back to the furnace for the next batch) and the beans are passed through a final quality control step. 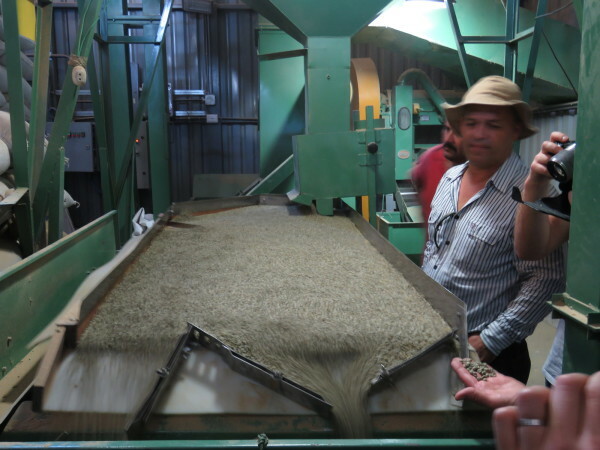 The vibrating sorter table uses a slight tilt and small ridges to shake the lighter, smaller lower quality beans to the left and lets the highest quality beans pass on the right and into bags. Nearly all of Costa Rica’s highest quality coffee is sold on the export market and nearly all of the beans are exported “green”. Roasters from the U.S. and Europe work a bit of magic and apply a great deal of science to the transformation of green beans to the deep brown coffee in your local market or Starbucks. Our degrees in biochemistry and my high school French came in handy on our last visit as we sat around the huge farm table at Villa Cavita on the Jorco coffee farm talking with the owner and grower, an El Salvadoran transplant to Belgium who worked as a buyer, a French roaster and a film crew from Poland and the Ukraine who were documenting the whole process. It was challenging trying to translate the concepts of high performance liquid chromatography, gas chromatography and mass spectrometry analysis of the chemical properties of the beans and the smoke and aromatics released during roasting. We learned a lot but the basic concept that came through most clearly was that a good roast was achieved by applying precisely the correct amount of heat for the critical few transformative seconds when the beans lost enough moisture to begin browning. Cupping may be another term you’re not familiar with if you’re not in the coffee trade. Until we’d seen a real cupping organized by several local ultra-premium growers for a buyer representing European roasters we thought cupping just meant tasting the coffee. It’s much more. Literally millions of dollars depend on the outcome of a high end cupping. 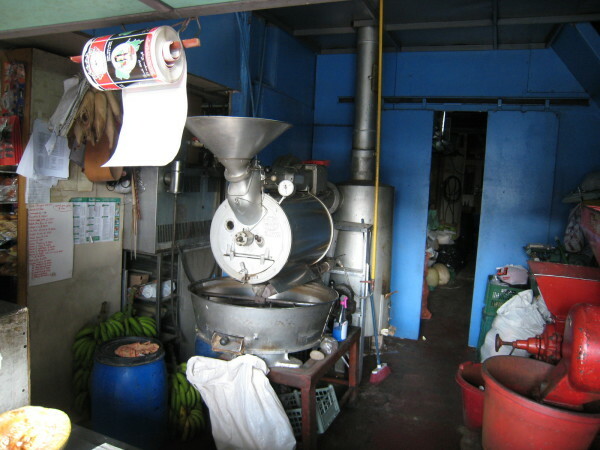 Green coffee sells for between a dollar and five dollars a kilo which is a huge range in price. A single small farmer’s entire crop might be worth anywhere between $50,000 and $250,000 depending on how well it cups. At one end of the spectrum he’ll have a hard time paying pickers, replacing equipment and buying fertilizer. At the other end he’s making a very comfortable living. The amount of work is the same either way. 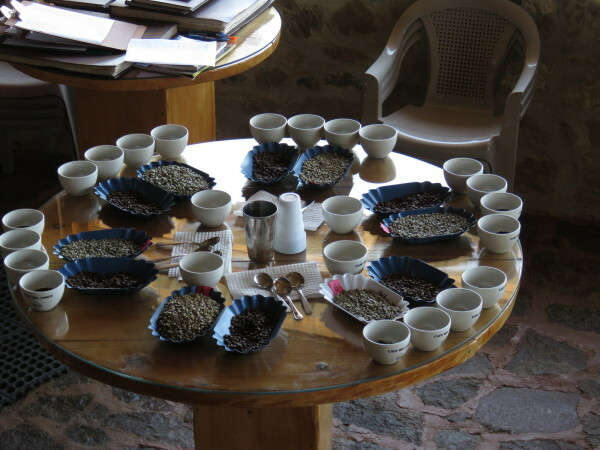 The whole process is shown and described in detail in this photo album of cupping coffee.